Allison Baggio continues to be in demand on the Ontario literary circuit. The Girl in Shades author helps ECW Press launch its fall 2013 list next week with a reading from her 2012 story collection, In the Body. All are welcome to this free event. 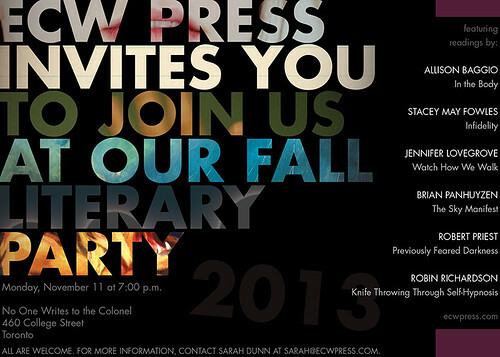 What: Allison Baggio reads from In the Body at the ECW Press Fall Literary Party. When: Monday, November 11, 2013, 7:00 p.m.
Where: No One Writes to the Colonel, 460 College St., Toronto, ON. How: Contact Sarah Dunn at sarah@ecwpress.com for further details.